Supporting a track and field team might sound like a simple enough, but when you look a bit closer you see it can often mean helping 100 athletes competing in vastly different sports. John Baumann knows the sport inside and out, having helped develop NCAA champions as both a technical coach and strength coach. 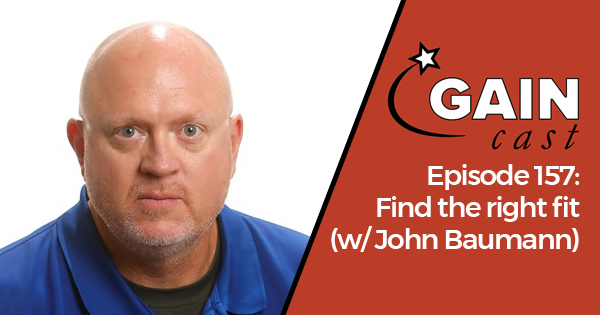 He joins this week’s GAINcast to talk about his work as the head strength and conditioning coach for the University of Kansas track and field team, how he learned from his background as a throws coach, and finding the right program for athletes from varied backgrounds and diverse events. Baumann is in his fourth year as head strength and conditioning coach for the University of Kansas track and field team. Previously he spent a decade as the throwing coach at Oklahoma State University and had multiple stints as a field events coach at the University of Illinois. As thrower at Doane College, he was also a 10-time All-American and inducted into the NAIA Hall of Fame. 5:15 – Looking back at the Allerton group. 9:45 – Seeking out lessons from other fields. 23:30 – Baumann’s athletic background. 31:15 – Being a support coach. The GAINcast is brought to you by GAIN and HMMR Media. Applications for GAIN are now open and you can learn more here or at www.thegainnetwork.com. We just announced the faculty on GAINcast 154. This month’s site theme is throwing. That ties into today’s episode, and we have more resources on the site. Click here for an overview of our top resource on all the throwing events. Join HMMR Plus so that you get full access to our video, article, and podcast archive. You can learn more about Baumann on the University of Kansas webpage. Baumann was mentored by and used to work for the legendary sprint coach Gary Winckler. You can learn more from Winckler on GAINcast 9. For more on Gary Winckler, his training philosophy, the concept of reactivity, periodization, and more, check out our four-part training talk from 2014.